Description: The Pushy Drummer was voted the "Most Ingenious New Push Toy of the Year" in 1934. This amazing toy soldier "walks" in a professional military manner when pushed. 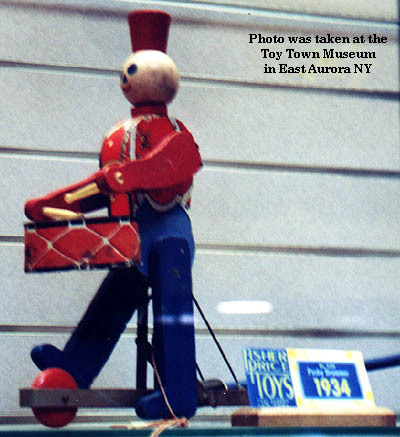 A cord attached to his push stick has a metal ring on the end that can be pulled to make the toy soldier beat a rapid drum roll. The soldier can beat his drum while he is marching and if he is standing still! FPT4270 - Pushy Drummer - Wooden toy soldier with bright four-color lithography on the sides of his body, his chest, and his back of a red band jacket with white stripes and yellow decorations on the chest. Soldier has a round wooden head with a pre-printed face (blue eyes, blue triangular nose, blue eyebrows, and a red line smile mouth. Drummer has a round red wooden hat, red wooden arms, each with a drum stick attached to the hand, and blue wooden legs that marched when Pushy Drummer is pushed. Drummer has a round metal drum attached to the front of his belly. The drum has a red paper lithograph attached to the sides with white X lines on the sides and black around the top and bottom rim. The soldier is attached to a metal frame with 3 red wooden wheels (one in the front, two in the back) and a black wooden hollow knob in the back to connect the removable push stick. A string attached to the soldier and push stick has a round metal ring on the end. When the ring is pulled, the soldier will beat his drum. Measures 12" high, 9" long, 5" wide. FPT4814 - Blue 18" long wooden push stick with a round red wooden knob on one end to prevent accidents and screw threads on the other end to screw into the back frame of the Pushy Drummer. Original retail price in 1934 was $1.25.